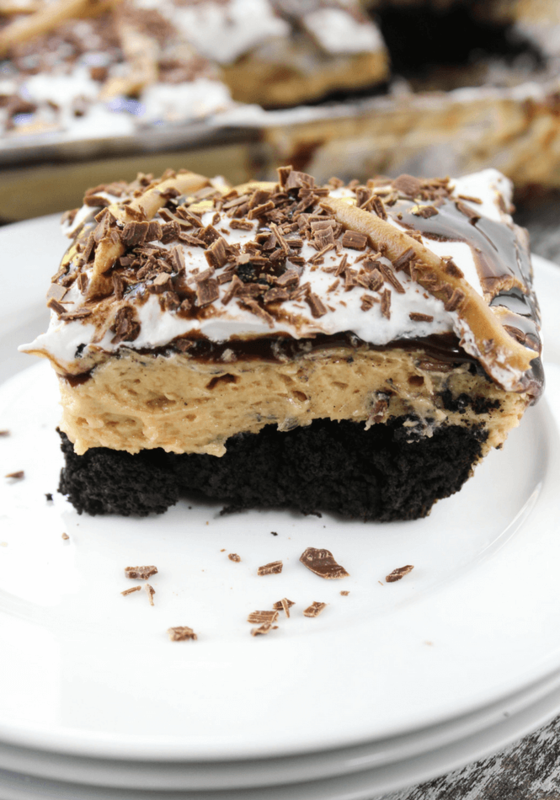 Peanut Butter and Chocolate Layered Dessert with a decadent brownie bottom, creamy no-bake peanut butter layer, fudge and whipped topping. Sometimes you come across a dessert that is just pure joy in every bite. This is one of those desserts. Joy in every single crumb. 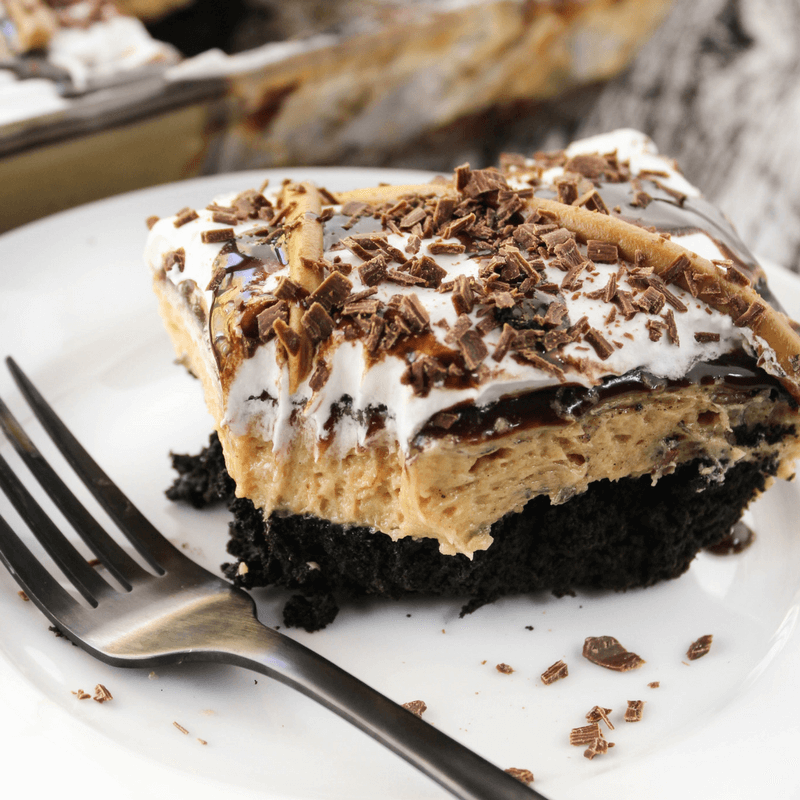 What makes this Peanut Butter and Chocolate Layered Dessert insanely delicious? It all starts with the fudgy brownie bottom. The brownie is made from dark cocoa and adds a richness and beautiful texture. Then, comes the peanut butter layer which is probably my favorite part. 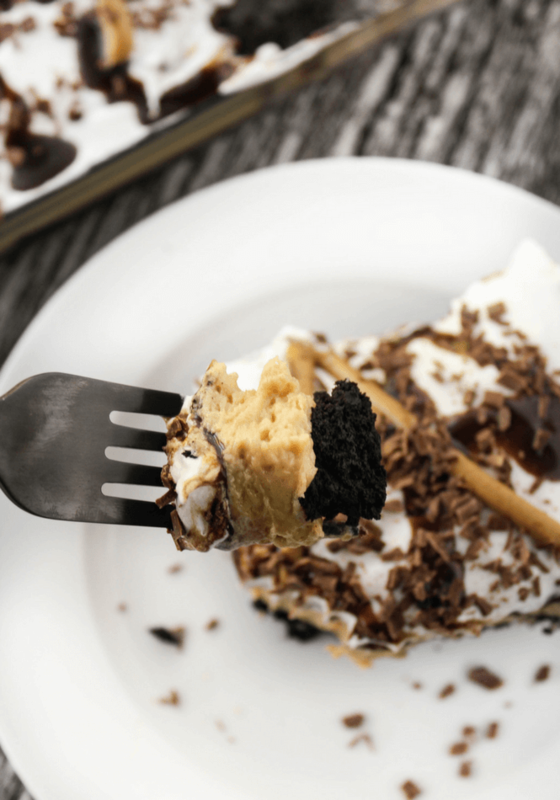 I have a serious soft spot for peanut butter desserts! 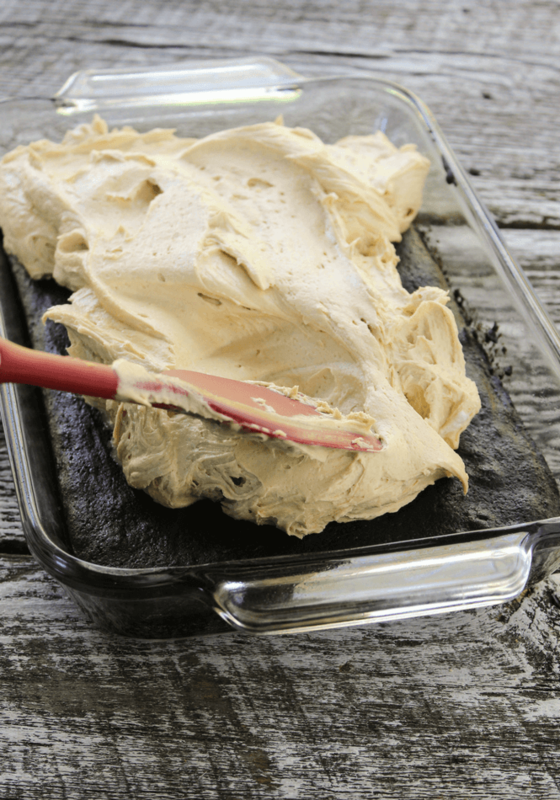 Cream cheese, peanut butter and whipped topping are mixed together to form a creamy center. Add a layer of chocolate fudge and a layer of layer of whipped topping to complete. You can use any brownie recipe you like but I recommend the one in the recipe card because it is really rich. Use non-stick pray a 9 x 11 pan/casserole dish and mix the brownie batter. Bake the brownie and let cool before adding the next layers. Time for the peanut butter layer! Mix and spread over the brownie, followed by the fudge, then whipped topping. Place the dessert in refrigerator until chilled and then garnish as you wish. Drizzle peanut butter and chocolate fudge over top, shred some chocolate chunks or even chop up some peanut butter cups. Oil a 8 x 11 dish with non-stick spray. Melt 2 sticks of unsalted butter. In a mixing bowl, add 4 eggs, 1 cup granulated, 1 cup brown sugar and melted butter. Use a hand mixer to blend well. Add 1.25 cups dark cocoa, 2 teaspoons vanilla extract, .5 cup flour, .5 teaspoon salt. Mix again and pour into your dish. Bake for 35-40 minutes until a toothpick inserted comes out clean. Remove the brownie from oven and let cool. Mix the peanut butter filling. Add 3/4 cup peanut butter and 8 ounces cream cheese. Use a hand mixer to blend until creamy. Add in 1 cup sugar and 8 ounces whipped topping and blend thoroughly. Pour on top of the brownie layer. Use a spatula to spread evenly. Heat up the jar of fudge in the microwave for 1 minute. Pour 3/4 of jar over the peanut butter layer and spread evenly. Place in the refrigerator until chilled and fudge is set. Place 8 ounces of whipped topping on top of fudge layer and spread evenly. Garnish however you please. 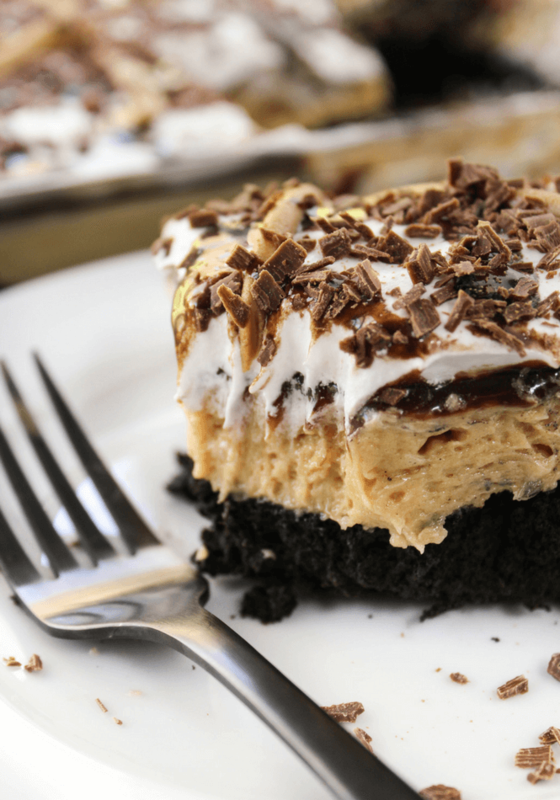 Drizzle fudge and peanut butter over top. 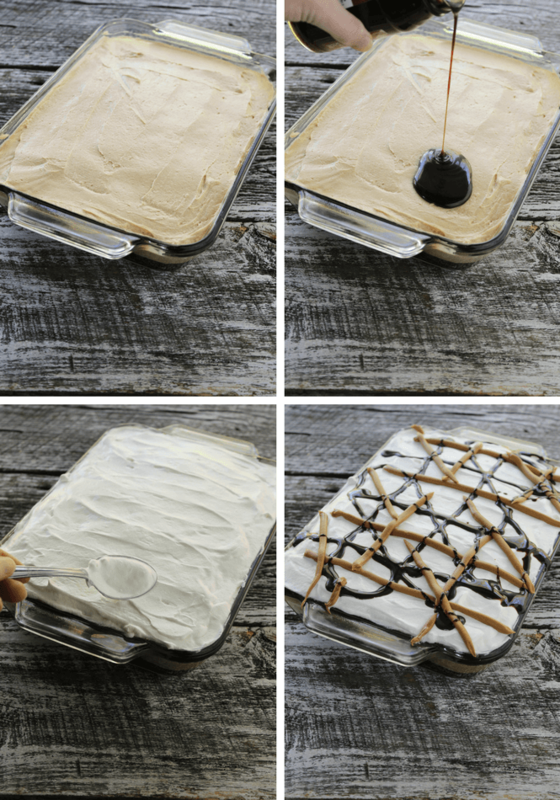 Place the fudge ad peanut butter into pastry bags with small tips for easy decorating. Shave a chocolate bar and sprinkle on top. Peanut butter cups could also be used. 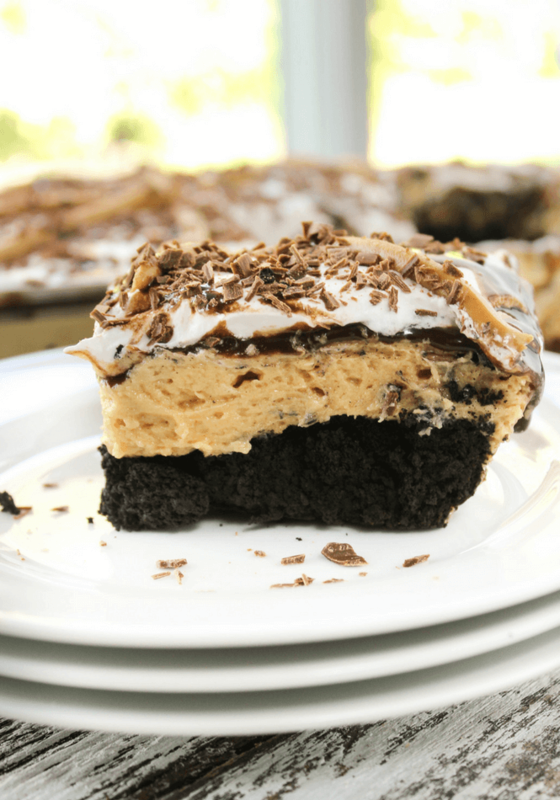 You are not going to want to miss out on this Peanut Butter and Chocolate Layered Dessert! Do you have a family gathering or birthday coming up? This will be a hit! This was amazing. Instead of the 1 cup granulated sugar being used in the filling, I used powder sugar and it was amazing. I also made the recipe by doing 1 and half of everything to fill a 9×13 pan and it worked perfectly. The confectioners sugar is a good idea! Wow… This looks amazing ? I might have to try making this for Thanksgiving! Oh yea, would be a great holiday dessert! It is such a hit. This looks divine!! My husband would go crazy for this!! If I make this, people will adore me. Then they’ll start following me around and wanting selfies with me. Could turn into a real problem. I’m risking it! Pinned this! Lol. 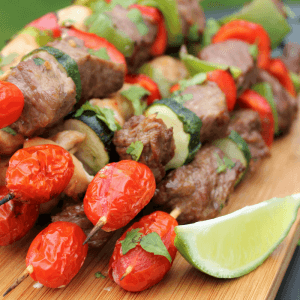 People will adore you for this recipe for sure!